Gonaïves lies in the north of Haiti, part of Artibonite Department. With a population of 300,000, it has become recognized as Independence City. It was in Gonaïves Haiti achieved her independence from France in 1804. 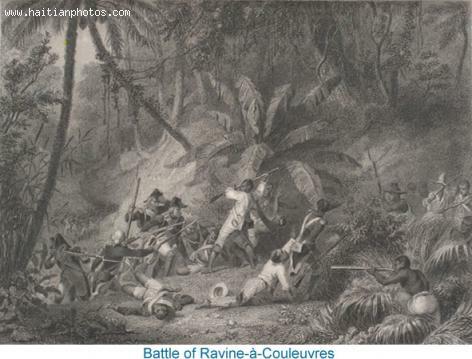 A pivotal battle was fought close by Gonaïves in 1802 by General Louverture at Ravine-a-Couleuvres, a French stronghold. Louverture, on his way to help General Vernet defend Gonaïves, collided with French General de Rochambeau in the Battle of Snake Gully. The encounter gave Vernet time to torch Gonaïves before escaping with his army, to prevent French occupation. Two years later on January 1, 1804, Haiti's first ruler, Jean-Jacques Dessalines, proclaimed Haiti's independence with the Act of Independence read in Place d'Armes at Gonaïves. Dessalines demonstrated his hatred toward the French by initiating the 1804 Haiti Massacre, slaughtering hundreds of them. In contradistinction, his wife Marie-Claire Félicité, rescued dozens of them from death, even secreting one Frenchman beneath her bed. She relentlessly opposed her husband's attitude toward the French. Félicité became royalty when Dessalines assumed emperorship of Haiti, but after his death she became deprived of her fortune and died in poverty in 1858. Since then Gonaïves has been beset by both natural and political calamities. It has survived major hurricanes and political upheaval. In the first half of the 2000s, Gonaïves experienced riots arising from enemies of President Arisitide. They invaded Gonaïves, initiating the Haitian Revolution of 2004. Today Gonaïves is a stable community freed from violence of the past.